The United States Congress designated the Mount Thielsen Wilderness (map) in 1984 and it now has a total of 55,127 acres. All of this wilderness is located in Oregon and is managed by the Forest Service. Carved majestically by glacial activity and rising 9,182 feet to aspire-shaped summit referred to sometimes as the "Lightning Rod of the Cascades," Mount Thielsen anchors the southern portion of this Wilderness. To the south is Crater Lake National Park, and on the periphery is flat to moderately rolling country, which changes to very steep and sharply dissected ridges toward the crest of the Cascade Mountains. Timberline stands at about 7,200 feet, just above a forest of mountain hemlock and fir mixed with whitebark pine. Lodgepole pine dominates the vegetation lower down. Many streams carry a substantial amount of snowmelt in spring, giving rise to an abundance of early summer mosquitoes. 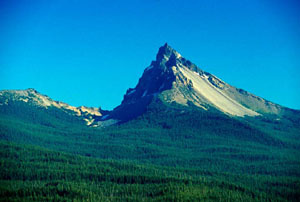 A 34-mile segment of the Pacific Crest National Scenic Trail crosses the Wilderness from Tolo Mountain in the north to near Summit Rock in the south. The Mount Thielsen Trail enters for approximately five miles from the west side to rise above the tree line and, after 200 feet of hand-over-hand scrambling, finally reaches to within 80 feet of the summit and a breathtaking view. The summit itself requires a short technical climb. The trail system totals about 78 miles. The land on the eastern side of the crest ranks among the most pristine in the state, a region far less visited by humans. Planning to Visit the Mount Thielsen Wilderness? How to follow the seven standard Leave No Trace principles differs in different parts of the country (desert vs. Rocky Mountains). Click on any of the principles listed below to learn more about how they apply in the Mount Thielsen Wilderness.